Pictured (left to right): Joani Madarash, Christian Fogarazzo, Richard Walker, Dan Ahouse, New York State Senator Carl Marcellino, Dana DeSanto, Dr. Bertolt Meyer, Rob Warburton, John O'Farrell, Lakeisha McCoy, and Jennifer Ostrager. 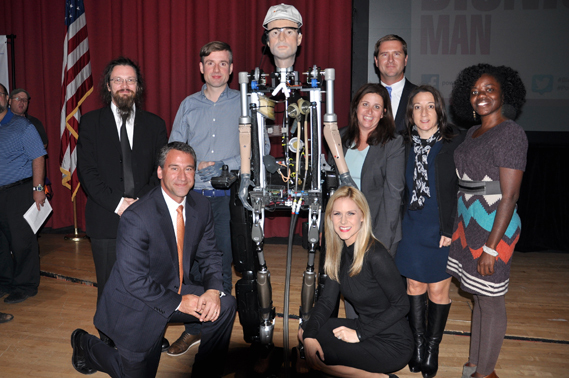 On October 9, High-school students, including members of the FIRST Robotics Team 3624, had the opportunity to meet “The Incredible Bionic Man” at the Half Hollow Hills High School East Auditorium. 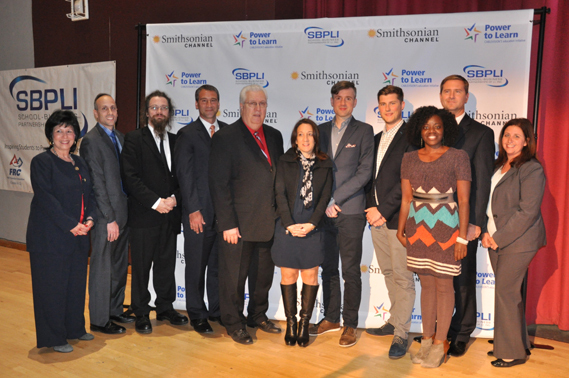 The event was sponsored by School-Business Partnerships of Long Island, Inc. in conjunction with and the Smithsonian Channel. At the event, students watched a demonstration of the Bionic Man and participated in a question-and-answer session with NYS Senator Carl Marcellino, Shadow Robot inventor Richard Walker and Social Psychologist Dr. Bertolt Meyer. They also got sneak peek” of the film The Incredible Bionic Man that will premiere this month on Smithsonian Channel – a documentary that captures cutting-edge science that not long ago was the stuff of science fiction. News 12 appeared at the event and documented students learning about the Bionic Man and how important it is for them to attend science and technology programs like this one.